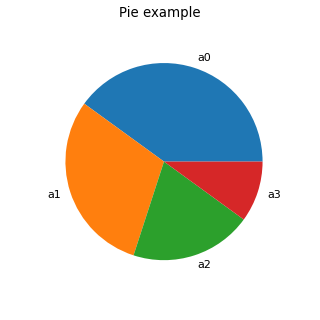 Sequence giving the percentiles of the pie. Names of each group. If not specified, by default equal to the description of the probabilistic input vector. Center of the pie inside the bounding box. If not specified, by default it is (0,0). Radius of the pie. If not specified, by default it is 1. Names of the colors. If not specified, colors are successively taken from the list given by buildDefaultPalette(), in the same order. ConvertFromHSV(hue, saturation, value) Convert an HSV triplet to a valid hexadecimal code. ConvertFromHSVA(hue, saturation, value, alpha) Convert an HSVA quadruplet to a valid hexadecimal code. ConvertFromHSVIntoRGB(hue, saturation, value) Convert an HSV triplet into an RGB triplet. ConvertFromName(name) Convert a color name to a valid hexadecimal code. ConvertFromRGB(*args) Convert an RGB triplet to a valid hexadecimal code. ConvertFromRGBA(*args) Convert an RGBA quadruplet to a valid hexadecimal code. ConvertToRGB(key) Convert an hexadecimal code into an RGB triplet. ConvertToRGBA(key) Convert an hexadecimal code into an RGBA quadruplet. GetValidColors() Return the list of the valid colors of the drawable element. GetValidFillStyles() Return the list of the valid fill styles of the drawable element. GetValidLineStyles() Return the list of the valid line styles of the drawable element. GetValidPointStyles() Return the list of the valid point styles of the drawable element. IsValidColorPalette(palette) Test the validity of a color palette. buildDefaultLabels() Build default labels by taking the percentiles. clean() Clean all the temporary data created by draw() method. draw() Generate R command for plotting through R.
getBoundingBox() Accessor to the bounding box of the whole plot. getCenter() Accessor to the center of the Pie inside the bounding box. getColor() Accessor to the color of the drawable element. getColorCode() Accessor to the code of the color of the drawable element. getData() Accessor to the data from which the Drawable is built. getDrawLabels() Accessor to the indication of data labels’ presence within the drawable element. getEdgeColor() Accessor to the color of the Polygon edge. getFillStyle() Accessor to the fill style of the drawable element. getLabels() Accessor to the labels of data. getLegend() Accessor to the legend of the drawable element. getLevels() Accessor to the levels of the Contour. getLineStyle() Accessor to the line style of the drawable element. getLineWidth() Accessor to the line width of the drawable element. getOrigin() Accessor to the origin of the BarPlot. getPalette() Accessor to the names of the colors used for the Drawable. getPaletteAsNormalizedRGBA() Accessor to the Red, Green, Blue, Alpha components of the palette on a unit scale. getPattern() Accessor to the pattern of the Staircase. getPointCode(key) Accessor to the code of the points style. getPointStyle() Accessor to the point style of the drawable element. getRadius() Accessor to the radius of the Pie. getTextAnnotations() Accessor to the annotations of the Text. getTextPositions() Accessor to the position of annotations. getX() Accessor to the first coordinate. getY() Accessor to the second coordinate. setCenter(center) Accessor to the center of the Pie inside the bounding box. setColor(color) Accessor to the color of the drawable element. setDrawLabels(drawLabels) Accessor to the indication of data labels’ presence within the drawable element. setFillStyle(fillStyle) Accessor to the fill style of the drawable element. setLabels(labels) Accessor to the labels of data. setLegend(legend) Accessor to the legend of the drawable element. setLevels(levels) Accessor to the levels of the Contour. setLineStyle(lineStyle) Accessor to the line style of the drawable element. setLineWidth(lineWidth) Accessor to the line width of the drawable element. setOrigin(origin) Accessor to the origin of the BarPlot. setPalette(palette) Accessor to the names of the colors used for the Pie. setPattern(style) Accessor to the pattern of the Staircase. setPointStyle(pointStyle) Accessor to the point style of the drawable element. setRadius(radius) Accessor to the radius of the Pie. setTextAnnotations(textAnnotations) Accessor to the annotations of the Text. setTextPositions(textPositions) Accessor to the position of annotations. setX(x) Accessor to the first coordinate. setY(y) Accessor to the second coordinate. List of n color codes defined according to the default palette. The colors are generated in the HSV space, with H (the hue) varying in a number of different values given by ‘Drawable-DefaultPalettePhase’ in ResourceMap and V (the value) being decreased linearly at each cycle of the hue. Convert an HSV triplet to a valid hexadecimal code. Hexadecimal code of the color. Convert an HSVA quadruplet to a valid hexadecimal code. Convert an HSV triplet into an RGB triplet. RGB (Red, Green and Blue) components of the color. Convert a color name to a valid hexadecimal code. Name of the color. The valid color names are given by the GetValidColors() method. Convert an RGB triplet to a valid hexadecimal code. These values are the Red, Green and Blue components of a color, a value of 0 (or 0.0) meaning that the component is absent in the color, a value of 255 (or 1.0) meaning that the component is fully saturated. Convert an RGBA quadruplet to a valid hexadecimal code. Level of the color’s transparency, 0 (or 0.0) meaning that the color is fully transparent and 255 (or 1.0) meaning that the color is fully opaque. The alpha channel is only supported by a few devices, namely the PDF and PNG formats, for the other format the color is fully transparent as soon as its alpha channel is less than 255 (or 1.0). Convert an hexadecimal code into an RGB triplet. List containing the RGB (Red, Green and Blue) components of the color. A value of 0 meaning that the component is absent in the color, a value of 255 meaning that the component is fully saturated. Convert an hexadecimal code into an RGBA quadruplet. List containing the RGB (Red, Green and Blue) components. A value of 0 meaning that the component is absent in the color, a value of 255 meaning that the component is fully saturated. It contains also alpha, the level of transparency of the color. Alpha equal to 0 meaning that the color is fully transparent and 255 meaning that the color is fully opaque. Return the list of the valid colors of the drawable element. List of the valid colors of the drawable element. Return the list of the valid fill styles of the drawable element. List of the valid fill styles of the drawable element. Return the list of the valid line styles of the drawable element. List of the valid line styles of the drawable element. Return the list of the valid point styles of the drawable element. List of the valid point styles of the drawable element. Test the validity of a color palette. True if palette is valid or False otherwise. Build default labels by taking the percentiles. Call BuildDefaultPalette() with the size of data as argument. Clean all the temporary data created by draw() method. Generate R command for plotting through R.
R command used mainly by the draw method of Graph. Accessor to the bounding box of the whole plot. Accessor to the center of the Pie inside the bounding box. Center of the Pie inside the bounding box. Accessor to the color of the drawable element. Name of the color of the lines within the drawable element. It can be either the name of a color (e.g. ‘red’) or an hexadecimal code corresponding to the RGB (Red, Green, Blue) components of the color (e.g. ‘#A1B2C3’) or the RGBA (Red, Green, Blue, Alpha) components of the color (e.g. ‘#A1B2C3D4’). The alpha channel is taken into account only by the PDF and PNG formats, for the other format the color is fully transparent as soon as its alpha channel is less than 255 (or 1.0). Use GetValidColors() for a list of available values. Accessor to the code of the color of the drawable element. Hexadecimal code corresponding to the RGB (Red, Green, Blue) components of the color of the lines within the drawable element or the RGBA (Red, Green, Blue, Alpha) components of the color. Accessor to the data from which the Drawable is built. Data from which the Drawable is built. Accessor to the indication of data labels’ presence within the drawable element. True to draw the data labels, False to hide them. Accessor to the color of the Polygon edge. Color of the edge of the Polygon. Accessor to the fill style of the drawable element. Fill style of the surfaces within the drawable element. Use GetValidFillStyles() for a list of available values. Accessor to the labels of data. Describes the data within the drawable element. Accessor to the legend of the drawable element. Legend of the drawable element. Accessor to the levels of the Contour. Different levels where the iso-curves of the Contour will be drawn. Accessor to the line style of the drawable element. Style of the line within the drawable element. Use GetValidLineStyles() for a list of available values. Accessor to the line width of the drawable element. Width of the line within the drawable element. Accessor to the origin of the BarPlot. Value where the BarPlot begins. Accessor to the names of the colors used for the Drawable. Names of the colors used for the Drawable. It can be either the name of a color (e.g. ‘red’) or an hexadecimal code corresponding to the RGB (Red, Green, Blue) components of the color (e.g. ‘#A1B2C3’) or the RGBA (Red, Green, Blue, Alpha) components of the color (e.g. ‘#A1B2C3D4’). Accessor to the Red, Green, Blue, Alpha components of the palette on a unit scale. Sample of the four components of each color of the palette on a unit scale. Accessor to the pattern of the Staircase. Pattern of the Staircase which is ‘S’ or ‘s’. By default the pattern is equal to ‘s’. Going from to with , pattern=’s‘ moves first horizontal then vertical, whereas pattern=’S’ moves the other way around. Accessor to the code of the points style. Style point to be changed in code. Code of the style of the points within the drawable element. Accessor to the point style of the drawable element. Style of the points within the drawable element. Use :meth:GetValidPointStyles for a list of available values. Accessor to the radius of the Pie. Accessor to the annotations of the Text. Accessor to the position of annotations. Accessor to text position with respect to data coordinates. Text is written below (position=1), above (position=3), to the left (position=2) or to the right (position=4) of data coordinates. Accessor to the first coordinate. Values of the first coordinate. Accessor to the second coordinate. Values of the second coordinate. Describes the color of the lines within the drawable element. It can be either the name of a color (e.g. ‘red’) or an hexadecimal code corresponding to the RGB (Red, Green, Blue) components of the color (e.g. ‘#A1B2C3’) or the RGBA (Red, Green, Blue, Alpha) components of the color (e.g. ‘#A1B2C3D4’). The alpha channel is taken into account only by the PDF and PNG formats, for the other format the color is fully transparent as soon as its alpha channel is less than 255 (or 1.0). Use GetValidColors() for a list of available values. Accessor to the names of the colors used for the Pie. Names of the colors used for the Pie. It can be either the name of a color (e.g. ‘red’) or an hexadecimal code corresponding to the RGB (Red, Green, Blue) components of the color (e.g. ‘#A1B2C3’) or the RGBA (Red, Green, Blue, Alpha) components of the color (e.g. ‘#A1B2C3D4’). Use GetValidColors() for a list of available values. Style of the points within the drawable element. Use GetValidPointStyles() for a list of available values.